Are you tired of scrolling facebook and seeing countless articles about how you SHOULD or SHOULDN’T be living your life? I know I was and actually stopped following major blogging sites as a result. I noticed I was feeling worse and the culprit wasn’t facebook envy. It’s filled with negative judgement and shame. Now I’m NOT saying that no one makes mistakes…. it’s just that we can phrase things slightly differently and by doing so it has a surprising effect on our mood….. The first one is a JUDGEMENT on yourself. Whereas the second sentence is not judgmental but yet an observation of the consequence of eating the bag of chips. By observing the situation we can better LEARN from the mistake and work on acting differently to CHANGE the emotional response. It might sound silly to some people, but by working to cut out or reduce these negative/judgmental words, depression symptoms will lessen and you will begin to feel better about yourself. We don’t should on our friends…. (sometimes we do) but often times when we are trying to be kind and compassionate to our friend who is shoulding on themselves, we help them see the positive, or help them reword their mistake to be less judgmental. Therefore most people already possess the skill to change their thought patterns and negative self talk as demonstrated by doing it with others. We just need to start practicing it on ourselves. Next time you hear your voice shoulding on yourself, stop and think for a minute. How can I reword this? 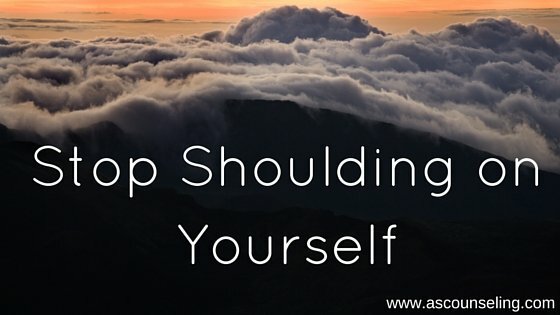 Is shoulding on myself helping me?